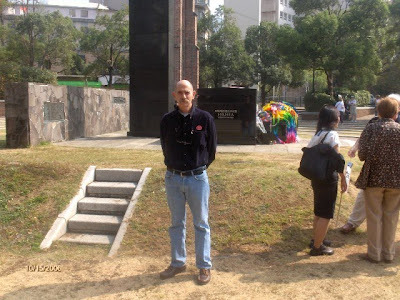 A visit to Ground Zero where the Atomic Bomb, Fat Man, was dropped on the Japanese city of Nagasaki on August 9, 1945. 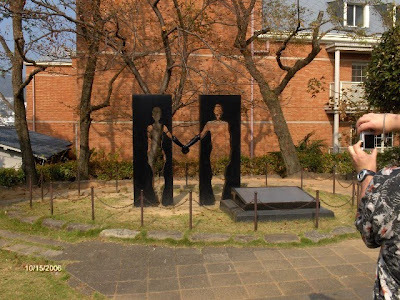 Within the first two to four months of the bombings, the acute effects killed 60,000–80,000 in Nagasaki, with roughly half of the occurring on the first day. Growing up in the 1950s and 60s, I certainly never thought I would visit ground zero where one of the atomic bombs was dropped in World War II. 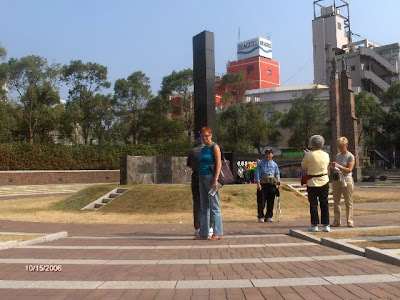 But there we were, at ground zero in Nagasaki. What an incredible experience! 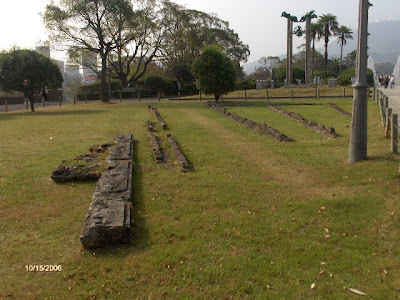 The Peace Memorial Park was our first stop on our shore excursion tour. 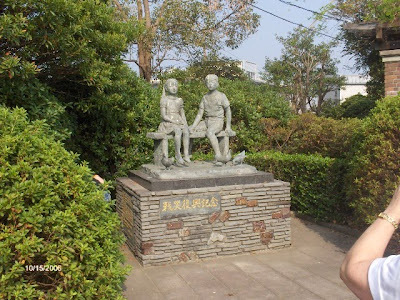 The park is lined with statues donated by various sister-cities of Nagasaki and many countries around the world. This is the beautiful Peace Statue, completed in 1955. 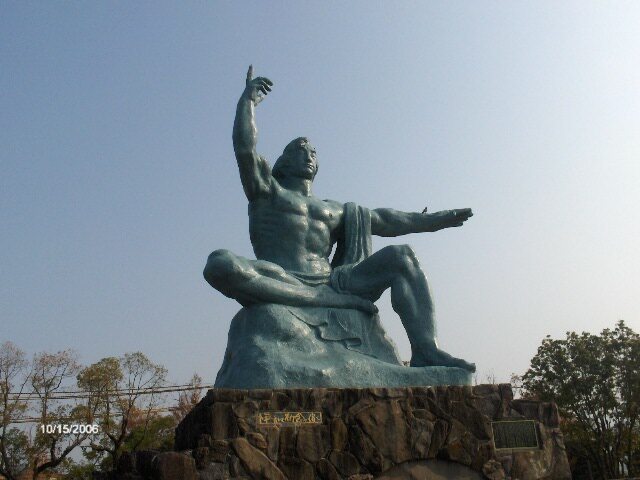 The statue's right hand points to the sky to signify where the bomb came from while the left hand is outstretched in a gesture of peace. The right leg is bent under and the eyes are closed to symbolize tranquility and meditation while the statues left leg is planted ready for action to assist humanity. 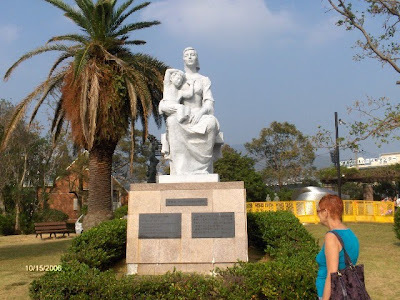 Peace Memorial park is lined with statues donated by various sister-cities of Nagasaki all ove the world. Cameras were not allowed at the Atomic Bomb Museum. The emphasis is on the suffering of mothers and children, but since the men were mostly off fighting the war, this is not surprising. 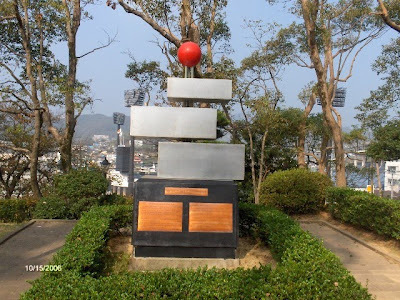 The museum makes much of the fact that many scientists and politicians advised the US not to drop the bomb but there was no mention that Japan had bombed Pearl Harbor.